It’s that time of the year again folks — Passover season approaches, and with that comes the annual stocking of the KFP Coca-Cola, the “Real Thing”. I’ve resurrected and updated this post from last year so you can get the jump on it early. Both Coca-Cola of New York and Chicago have just started their production runs, so be vigilant! In April of 1985, the Coca-Cola company announced that it was re-formulating its flagship carbonated drink, which to the horror of Coke fans everywhere, included a switchover to high fructose corn syrup (HFCS). Soon, the rest of the soft drink industry followed suit, and the classic taste of cane sugar-based sodas became practically extinct. Today, only a few small boutique soft drink companies still make sodas with refined cane sugar (or sucrose, made from sugar beets) a costly ingredient when compared with HFCS — but true carbonated beverage connoisseurs know and can tell the difference, as corn syrup has a characteristically cloying sweetness when compared to refined sugar. For nostalgic Coca-Cola lovers, unless you live in a foreign country that classic taste is but a distant memory. 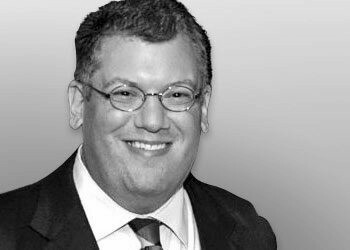 Every late March and early April, for the two to three weeks leading up to the celebration of the Jewish Passover holiday season in the United States, Coke fans living in major metropolitan areas with large Jewish populations get their Real Thing, if only for that brief fleeting period. According to Jewish law, nothing made with chametz (any of a number of proscribed cereals and grains, including corn) during passover may be consumed — so in order not to lose sales from observant Jews during that eight day period, a small number of Coca-Cola bottlers make a limited batch of the original Coke formulation, using refined sugar. Needless to say, stocks run out quickly and fans of Passover Coke have been known to travel many miles seeking out supermarkets with remaining caches. Passover Coke products (and Passover Pepsi) in 2-Liter bottles can be distinguished by their yellow caps, inscribed either with just the “OU-P” symbol and/or the words Kosher L’Pesach in Hebrew. The canned variety is rare and is known to be produced only by a scant few bottling companies in the United States — if you can find any, be sure to snap it up. Coca Cola will again be available with an OU-P for Pesach. Aside from the New York metropolitan area, Coke will be available in Boston, Baltimore-Washington, Miami, Atlanta, Houston, Philadelphia, and Los Angeles. This year, in New York, Coca Cola items will be made with an OU-P in 2 liter bottles and in cans. Other locations will have more limited Coke items made in different sizes. All these items, of course, require the OU-P symbol. Most of the bottling plants servicing these markets will designate the Passover Coke items with a distinctive yellow cap in addition to the OU-P symbol on the cap or shoulder of the bottle. Chicago Coke fans need not worry — this year, the Chicago Rabbinical Council is having Passover Coke made with the cRc P-09 logo on the cap using local bottlers. cRc also has Passover Coke in cans, which is nearly impossible to find anywhere else in the country. In addition to Coke and Pepsi products made with real sugar, you should also be able to find nationally Dr. Brown’s, perhaps the best black cherry soda on the planet in Kosher for Passover form. And to further improve your Passover Coke, hit it with a shot of Passover formulated Fox’s U-Bet chocolate syrup. For more on Passover Coke, be sure to listen to this interesting NPR broadcast from 2004. For more on Mexican Coke, KFP Coke’s south of the border cousin, have a look at what Kate at Accidental Hedonist has to say. Editor’s Note: Here’s one of our first posts on Off The Broiler, resurrected for Valentine’s Day weekend. I realize this blog is named after a Burger King-ism, but anyone who really knows me is well aware I am a staunch and rabid missionary of the Church of Slyders. This year, Rachel and I decided to celebrate our 11th Valentines Day together at White Castle. Sure, it was corny, it was chintzy, and we had this bloated nauseating feeling afterwards. But isn’t that what true love is supposed to be? 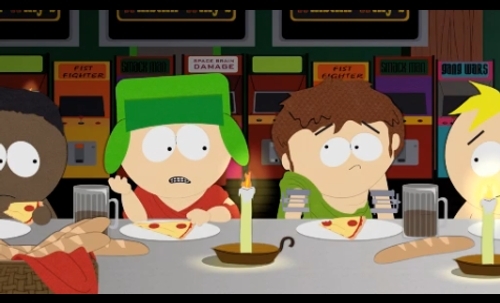 In my opinion Valentine’s day is a totally commercialized holiday, far worse than Christmas, that is designed to bilk your loved ones out of buying you totally useless throwaway gifts, and then to force you to endure one of the worst days of the year for restaurant going. What venue would be better than White Castle? Click on the “Read the rest of this entry” link below for more. 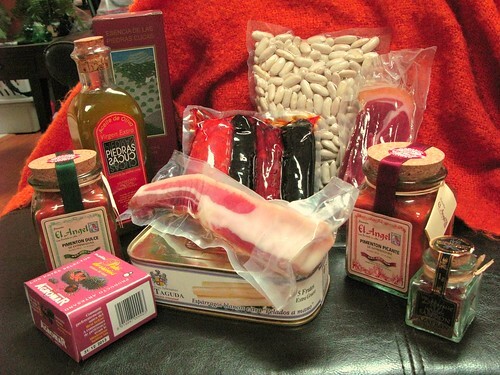 The Spanish Care Package from Pedro Espinosa Silva. Click to enlarge. Today, I received a curious package via international mail — addressed to me from Gastrovin Principano, in the town of Gijón in the Principality of Asturias, Spain. It turned out my friend and food writer Pedro Espinosa Silva, who was formerly the Spain host and manager at eGullet, had sent me a generous present thanking me for sending him some wireless computer equipment that he had paid for in the US but needed to have sent abroad last spring. Like Daniel Jackson, the archeologist and linguistics expert on Stargate SG-1, I tried to figure out what all of these contents meant. I could identify most of it — Extra Virgin Single Estate Olive Oil, Spicy and Sweet Spanish Paprika, White Asparagus, Sea Urchin Pate, and Mancha-grade Spanish Saffron. But sealed meats and the beans I couldn’t figure out what they were for, until I sprung this by fellow foodie Sam Kinsey, who immediately identified its contents, and I did some reading on Wikipedia. Yes, these things could be used to make Tapas, but specifically, Pedro was sending me a message… he wants me to make Fabada Asturiana. The beans, it turns out, are Fabes de Granja, Asturian White Beans, and the sausages are Chorizo and Morcilla (blood sausage). 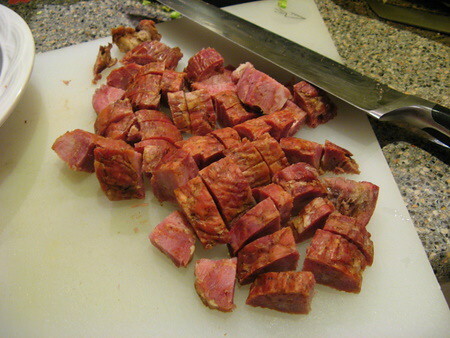 The long pork meat is bacon, to be simmered in the dish. I’m guessing the other type of ham is a bonus, to be eaten as tapas. Well I guess I know what I’m making this thanksgiving to go with the turkey! Fabada and tapas! 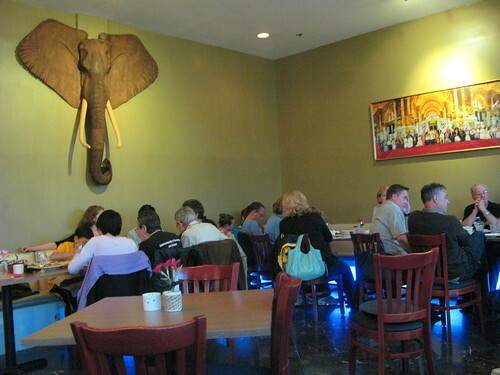 Pawana, a new Thai restaurant, has opened in what was the failed Thai Chef space in Englewood in the Shop Rite plaza. Thai Chef in my opinion was an overrated and expensive restaurant which had poor service and served food I could have better at Wondee’s or Bangkok Garden in Hackensack, the two best known Thai restaurants in the area. They spent a fortune building the space and promoted the hell out the restaurant, but they were never able to get a decent following and the restaurant was frequently mostly empty. Their problems were also compounded by the fact that the restaurant group opened ANOTHER Thai restaurant in the same town almost simultaneously, Kratiem (which is still in business but has different owners now). Thus it failed, and many began to wonder if opening a high-end restaurant in that shopping center was such a hot idea in the first place. While the new owner, a woman also named Pawana, is related to the Thai Chef company (she’s a cousin) the prices here are scaled back (comparable to Wondee’s or Saigon R in Englewood) the service was very good, and the food is excellent — in fact I’d say it will give both Wondee’s and Bangkok Garden a run for the money. In the two years after it opened, I only visited the restaurant perhaps one other time. It’s not that the restaurant wasn’t good — as you can see above, at the time I thought it was very good — but at the end of the day I felt that the food at Wondee’s was more to my personal taste in terms of authenticity. Due to the demographic makeup of Englewood versus Hackensack, Pawana is attracting more Americans, whereas Wondee’s attracts more Asians. Be it as it may, that was then and this is now. My tastes have changed and so have my dining habits. I recently returned to Pawana after a two year hiatus. I honestly have to say “What the hell took me so long?”. If you are willing to tell the server “I want it Thai spicy”, then Pawana will pull out the stops for you and give you a truly Thai experience. By the way — while the restaurant doesn’t say so on its menu, they serve brown rice if requested. Score one big point for the low-carber crowd. If you’ve been waiting to try Pawana, you can stop waiting. Run and eat there right away. Click on the “Read the rest of this entry” link below for more. Like many couples in the New York Metro area today, we stayed home on Valentine’s Day rather than brave the dangerous, ice-covered roads tonight. But that’s fine, just fine — we made us a wondermus gumbo. Nothing better than a pot of gumbo and a 30 year-old episode of Justin Wilson on the TiVo and cuddling up on the couch with your sweetheart on a freezing cold evening. Making gumbo is more of a method than it is a “recipe”. Louisianans make it with whatever proteins they got in the icebox, and throw it all in. But there are some basic things that are elemental to making gumbos. If you’re going to make a gumbo, and you have never made one before, I suggest consulting this classic eGullet thread, which I think is the definitive primer on gumbo cooking. What you’re going to want to nail down and absorb from that discussion is the whole process of cooking a roux, which is the core of a good gumbo. At the end of the day roux is simply flour cooked in oil, but it takes nerves of steel — cook a roux too little, you don’t get enough flavor. Cook it too much, you burn it. Getting it right on the edge of burned, where it gets that chocolate color is the real challenge, to get that dark gumbo flavor that we want. 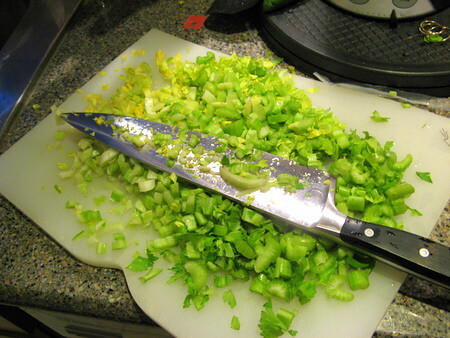 Finely chopped celery, onion, and invisible bell pepper. Unfortnately we had all the ingredients of gumbo EXCEPT for the green bell pepper, which is an essential part of the “trinity” that lies at the heart of the Cajun cooking. I was not going to leave my house and hit the icy roads to get bell pepper in a regular sedan without four wheel drive, so you native cajuns will have to forgive me in this instance. 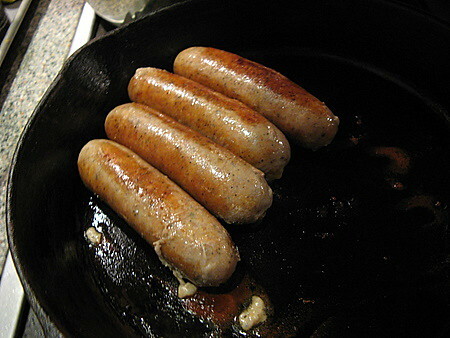 A bunch of fresh Pork and Crawfish sausages which we brought home from one of our Louisiana trips, that we pulled out of the freezer and browned in the pan. These will be just barely cooked and cut up into pieces. Andouille sausage, also from Louisiana. You could just as easily use Polish Sausage or some other kind of smoked pork sausage. Cubed smoked ham is also good to use as well. Want some good gumbo? I garontee you like it. Click on the “Read the rest of this entry” link below for more, cher. You are currently browsing the archives for the eGullet category.